Robert Francis Kennedy was presidential adviser to his brother, John F. Kennedy, who was the 35th U.S. president from 1961 until 1963. Bobby Kennedy then served as U.S. senator from 1965 - 1968. On June 6, 1966, Robert F. Kennedy delivered his Day of Affirmation Address at the University of Cape Town in Cape Town, South Africa. 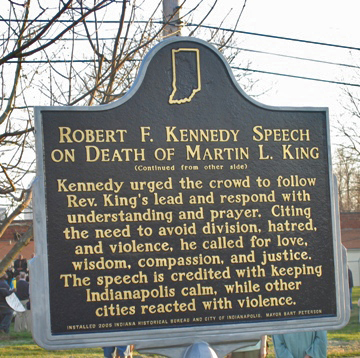 On April 4, 1968, Robert F. Kennedy gave his speech on the death of Martin Luther King, Jr., who was killed earlier that day. 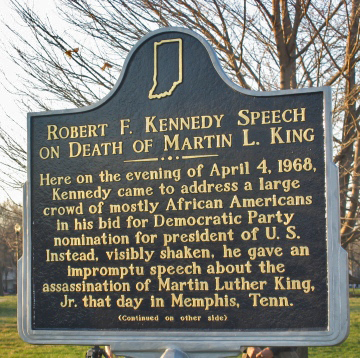 At the time, Kennedy was campaigning for his presidential nomination in Indianapolis, Indiana. Just weeks after MLK's assassination, Kennedy was assassinated himself. 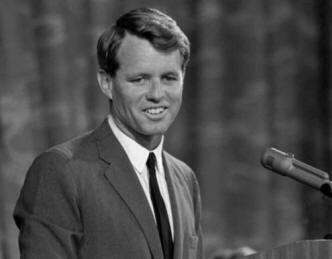 On June 5, 1968, shortly after midnight, senator and presidential candidate Robert F. Kennedy spoke to his followers at the Ambassador Hotel in Los Angeles, California, after winning the California presidential primary. Kennedy finished addressing a large crowd in the Ambassador Hotel and walked off stage toward the hotel's kitchen, through which he was to exit the ballroom. His protectors were two famous athletes, and they were trailing Kennedy. Sirhan Sirhan had read Kennedy's schedule in the newspaper and was waiting in the pantry when Kennedy was led through by a headwaiter. Sirhan opened fire with an Iver Johnson .22 revolver, striking Kennedy four times. Five other bystanders were also wounded. Due to the crowd, it took 17 minutes to evacuate Kennedy to an ambulance. He died 25 hours later. The assassin was Sirhan Bishara Sirhan, an immigrant from Palestine. He claimed that he had no memory of the night of the assassination. Sirhan serves a life sentence. If you want to dive further into the subject, the FBI Robert F. Kennedy Assassination Summary is for you. Check also Assassinations in History. On June 8, 1968, Robert's brother Ted delivered the eulogy, his Tribute to Robert F. Kennedy in New York City. Here is more about Robert's brother Edward Moore Kennedy (Ted). And here is more about Martin Luther King Jr.